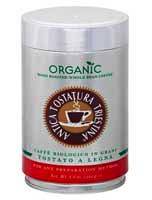 Antica Tostatura Triestine (or simply Antica) is an outstanding wood-roasted Italian espresso and coffee from Trieste, Italy, which is currently served in 26 countries worldwide. Martha Stewart has used our coffee exclusively on her show since its inception five years ago and it is endorsed as one of her “must have” products. Antica now carries a certified Organic line of whole bean and pre-ground coffees. In addition to the Organic line, they offer a complete range of wholesale and retail products suitable for preparation in retail environments using specialized commercial equipment, and at home using domestic espresso machine, 12-cup drip brewers, and classic Italian stove-top Moka or French press pots. All products are Kosher certified.